July 19, 2018, Evergreen, CO – After thirty-five years as an extreme endurance athlete, including running at least 129 races averaging over 125 miles each; completing twelve expedition-length adventure races; and ascending the Seven Summits, including Mount Everest, all on the first attempt, you might think Marshall Ulrich would retire. Besides finishing the Badwater 135 race more times than anyone else (twenty), Marshall’s won the race more times than anyone else (four), and set, and still holds – since 1991 – the record to the summit (just under 34 hours). He was also the first to complete a quad-crossing, as well as run it solo, completely unaided and self-supported. In 2012, he and Dave Heckman completed the first and only a self-supported circumnavigation of Death Valley National Park. “Doing these events just for me doesn’t make any sense, so this year I’m running in honor of my first wife, Jean, who passed away in 1981 at age 30 from invasive breast cancer,” Marshall explains. Before getting sick, Jean completed law school, passing the bar exam when she was eight months pregnant. After Jean’s passing, the JEAN SCHMID ULRICH ENDOWED SCHOLARSHIP FUND was established at the University of Denver, her alma mater. Every year, an aspiring attorney is granted a scholarship. “We desperately need more honest, decent attorneys like Jean,” Marshall says. You can keep this program going, and growing, by donating at https://fundrazr.com/UlrichBWforJean. Some may call him crazy, but he’s not. He has worked hard, however, having run close to 100,000 miles. He finished in less than 20 minutes in his first 5K. In his first ultra, a 50-miler in 1983, he finished fifth. At his first 24 hour run, he won by running more than 122 miles. In 1989, he was the first person to complete all six 100-mile trail races, finishing top ten in all but one race. When he realized he had a body and a constitution made to endure brutal conditions and injuries, cover unthinkable distances, and actualize goals that most people would think were impossible, he just kept going. Not only did Marshall succeed in ultrarunning but, in his forties, he started adventure racing: multi-day, plus-300-mile, multi-sport, self-navigated races in places like Morocco, Borneo, and Tibet. In his fifties, he set his sights on the Seven Summits, the highest peak on each continent, finishing in less than three years, while competing at Badwater every summer. In 2008 he ran 3,063 miles from San Francisco to New York in just over 52 days, at the age of 57. His memoir, RUNNING ON EMPTY, is a thrilling look into the mind of someone who has accomplished more than most people can comprehend. He’s working on his second book, BOTH FEET ON THE GROUND, to share more of his adventures and remind people of the importance of connecting with nature. Please visit www.MarshallUlrich.com for a closer look at Marshall’s adventures. Marshall Ulrich (b. July 4, 1951) is an elite extreme endurance athlete, as well as an accomplished speaker, author, trainer, and guide. Called the “Endurance King” by Outside magazine, he’s finished over 129 ultra marathons averaging over 125 miles each; climbed to the top of the highest mountain on every continent, including Mount Everest; and completed 12 expedition-length adventure races. 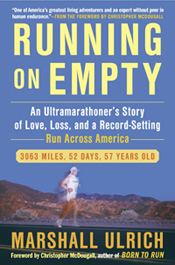 At the age of 57, Marshall clocked the third-fastest run across America, about which he wrote his book, “Running on Empty.” A record four-time winner of the Badwater Ultramarathon, Marshall has crossed Death Valley on foot, in July, a record 28 times, including a self-contained, unaided solo, a “quad” of nearly 600 miles, and the first-ever self-supported circumnavigation of Death Valley National Park. He lives with his wife, Heather, in Evergreen, CO. This entry was posted in Badwater Ultramarathon, Running. Bookmark the permalink.